English is Fun! : I know what you did last summer! Do you know the film What did Mel Gibson do? Watch the video and keep notes. Then find a partner and tell him 5 things Mel did. Now, write and share with your partner 8 things you did at the weekend. I talk to my friend online every day.... I talked to him yesterday as I was coming back from work but I din't talk to him the day before. I go to work early in the morning.... I went to work late on Friday because I was talking on the phone and I didn't go to work on Monday as it was the first day of Lent. My boss does the till every night .....He did the till last night but he didn't do it the day before. Watching movies is one of the best ways to improve your English skills! 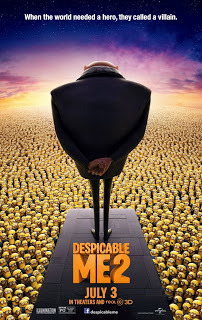 Here's a fun activity with Despicable Me, a very popular cartoon. I. Before watching the segment, complete the paragraph below with the simple past form of the given verbs. Gru was anxious about his date on the following day. He was happy, very happy. The alarm clock _________ at 8:30 am. He ____________ of bed and ____________ a shower with his toy ducks. Then he _________ his teeth, ______________ pancakes for breakfast, and _____________ real ducks cross the street. He happily ______________ the mall escalator. In the park, he _____________ a Frisbee and _____________ some tai-chi-chan. He also _____________ the drums with a few tin cans. Then he ___________ a flower to a young man for him to hand to a girl sitting next to him. III. Now write about a holiday you went on and what you did. Do not write the place! Let us guess where you went!! !